The Lady Bulldog basketball team ran the full gamut of the thrill of victory and the agony of defeat this weekend. 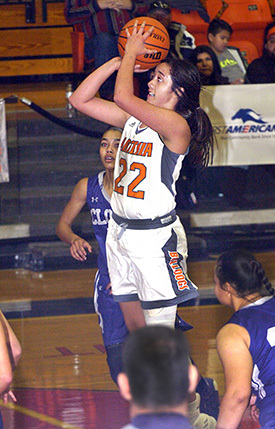 After taking down Class 6A Clovis in a solid effort Friday at Bulldog Pit, 56-38, the Artesia girls watched as their game-long lead over Deming – still at double digits with under four minutes to go in the fourth quarter – slipped away in the 11th hour Saturday on the road, 59-57. It was a bitter defeat but not one, head coach Jeff Houghtaling says, that will overshadow the Lady ‘Dogs’ overall efforts during the two-day run. “I think the girls did a lot of really good stuff tonight, and they played really hard,” Houghtaling said Saturday from Deming. “We just kind of got behind the eight ball in the fourth quarter. Artesia headed into the final eight minutes of Saturday’s contest up by 13 on the Lady Wildcats, 50-37. Gracie Puentes answered an opening basket by Deming’s Valerie Lopez to maintain that margin, but from there, the ‘Cats began to chip away. Deming went 5-7 from the free-throw line over the course of a three-minute span in which the Lady ‘Dogs were 0-2 and also scoreless from the field. That made it 52-44, and with around 2:50 on the clock, a Kari Dominguez trey was followed by an Artesia turnover and two more from the stripe by Lopez to quickly make it a one-shot game, 52-49. Puentes, Kali Crandall and Stacia Martinez all went 1-2 at the line to keep Artesia in front, but while the Lady Bulldogs’ drought from the field continued, the Wildcats’ did not: Dominguez logged a pair of layups and Lopez a three to give Deming a 57-55 edge with 35 seconds left to play. A questionable traveling call was levied as Puentes tripped over a Lady Wildcat lying on the floor during an offensive putback, but the senior got her revenge, stealing the ball and draining a clutch pair of free throws after being fouled on the ensuing layup to tie things up at 57-all. While Lopez posted a bucket for Deming, the Lady Bulldogs could not get a shot to fall in the final seconds, giving the ‘Cats the come-from-behind 59-57 win. “I think we were really prepared to play, just hats off to Deming – they shot the ball well down the stretch, made some free throws when they needed to, had a rowdy crowd behind them… it was a good game,” Houghtaling said. “Overall, it was a good learning experience for our girls. Artesia had battled the Lady ‘Cats blow for blow in the opening quarter of play Saturday, using an Alexa Riggs trey, and-ones by Puentes and Martinez, and a bucket apiece from Kyrah Gonzales, Puentes and Paityn Houghtaling to take a slight lead into the second, 15-14. There, the Lady Bulldogs stepped up their defensive effort, forcing eight Deming turnovers that limited the ‘Cats’ offensive opportunities. A three and an and-one by Riggs, consecutive baskets by Brehnan Davis and Crandall, a Houghtaling shot in the paint, and a last-second longball from Elisa Cardenas had Artesia up 30-22 at the break. The Lady ‘Dogs posted another solid offensive showing in the third, with Riggs and Gonzales logging three’s, and Davis, Cardenas, Puentes, Crandall and Ali Mauritsen all contributing inside the perimeter. Riggs and Puentes would lead Artesia on the night with 13 points each, while Lopez topped all scorers with 19 for Deming. The Lady Bulldogs showed none of those offensive lags Friday against Clovis at the Pit. Both squads got off to a bit of a sloppy start in the contest, committing a combined 13 turnovers in the opening quarter and leaving the game scoreless through the 4:45 mark. But Gonzales would drain one from beyond the arc a few seconds later to put Artesia on the board, and a bucket from Martinez and Crandall trey made it 8-2 with three minutes to go in the period. The Lady Wildcats were able to keep it close going into the second, 12-7, and were down by just four midway through that quarter, 17-13, despite a bucket and a trey from Houghtaling. Artesia would close out the half with an 8-3 run, however, that included a Gonzales three, a trio of free throws from Crandall, and a Puentes drive to the hoop to lead 25-16 at intermission. Clovis answered baskets by Houghtaling and Crandall in the early goings of the third with four of their own to get back within five, 29-24, but nine unanswered by Artesia – including another trey by Gonzales and baskets by Cardenas, Houghtaling and Puentes – bumped their advantage to 14 heading into the fourth, 38-24. And that time, the Lady ‘Dogs kept the pedal down. A Houghtaling shot off the glass, both ends of a one-and-one by Puentes, and a Riggs longball made it 45-28 with 4:30 to go in the game. The Lady Bulldogs then surrounded baskets from Puentes and Elliot Harrison with a solid 7-9 performance at the stripe to close out the 18-point victory, 56-38. “Clovis is pretty good,” Coach Houghtaling said Saturday. “I know they can shoot better than they did, and I think they just kind of had the wind taken out of their sails when they kept missing easy baskets. With the split, the Artesia girls move to 6-7 on the season as they prepare for another busy week. They’ll spend Tuesday and Friday on the road taking on Chaparral and Santa Teresa before returning to Bulldog Pit Saturday to host Albuquerque Academy. “We’ve got three really important games against quality 5A opponents coming up, and we have to get back on the bus for two of those,” said Houghtaling. “We’ve really talked to the girls about focusing when we’re traveling and being mentally prepared. A bus ride can go one of two ways: You can either use it as an opportunity to rest and prepare, or you can get sluggish and not be ready, so we’ll need to make sure we’re ready.